The British drum and bass duo - which consists of Joe Lenzie and Cameron Edwards - performed their recent hit 'Coming Home' featuring Rita Ora on the talent show last week and admitted they never imagined they would one day be on one of the biggest talent shows in the world. 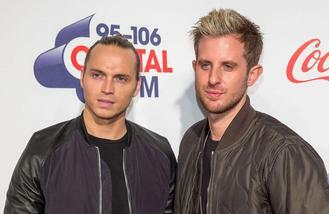 Asked what their highlight of 2015 was at Capital's Jingle Bell Ball with Cocoa Cola on Sunday (06.12.15), Cameron told BANG Showbiz: "'The X Factor' for me. It was something we never expected to do. Simon (Cowell) was really complimentary." The pair were thrilled to meet the music mogul - who gave their track his blessing - and joked that while they tried to give Simon a hug, he was actually very "formal" in return. "He's very sort of square when he speaks to you. He's comes up to you and he's very formal." The 'Changing' hitmakers are renowned for their upbeat dance anthems and confessed they'd love to collaborate with Adele next. Quizzed on who they would like to work with out of 'Bad Blood' singer Taylor and the British songstress, Cameron said: "I'd collaborate with Adele over Taylor Swift definitely. Yeah we love her. Taylor's great though." Meanwhile the duo released their debut album 'Life' on Friday (04.12.15) but Joe confessed it took a "back seat" because he was "so busy" with another exciting milestone last week. The 28-year-old producer shared: "We're obviously really happy with the end product and the music. We've had quite a few tweets from people. It's all been a bit hectic and I've been moving house, so to be honest it's kind of taken a back seat. I've been so busy!"